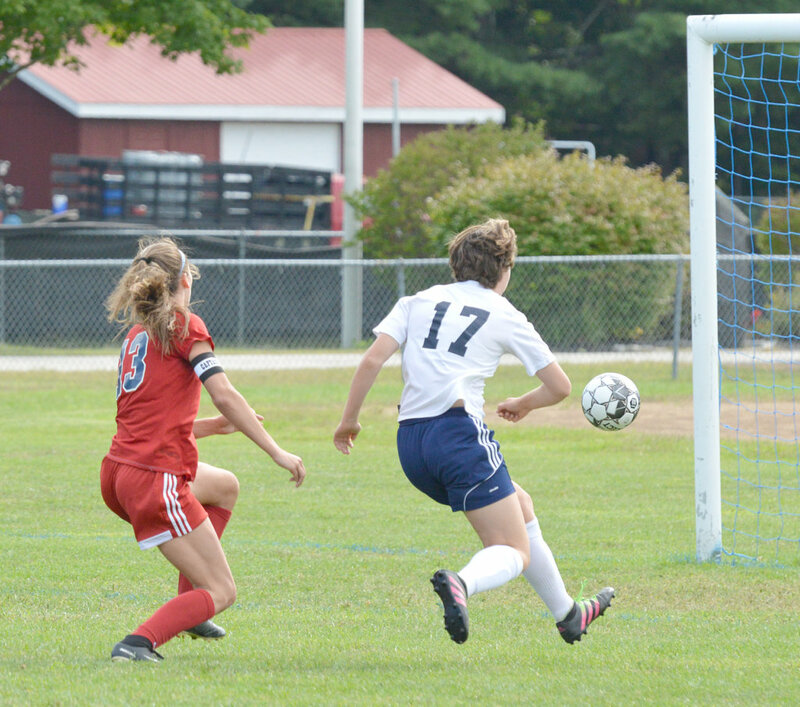 GRAY — The scoring chances were tilted heavily in Gray-New Gloucester’s favor at halftime, but the Patriots held only a one-goal lead over Poland on Saturday. 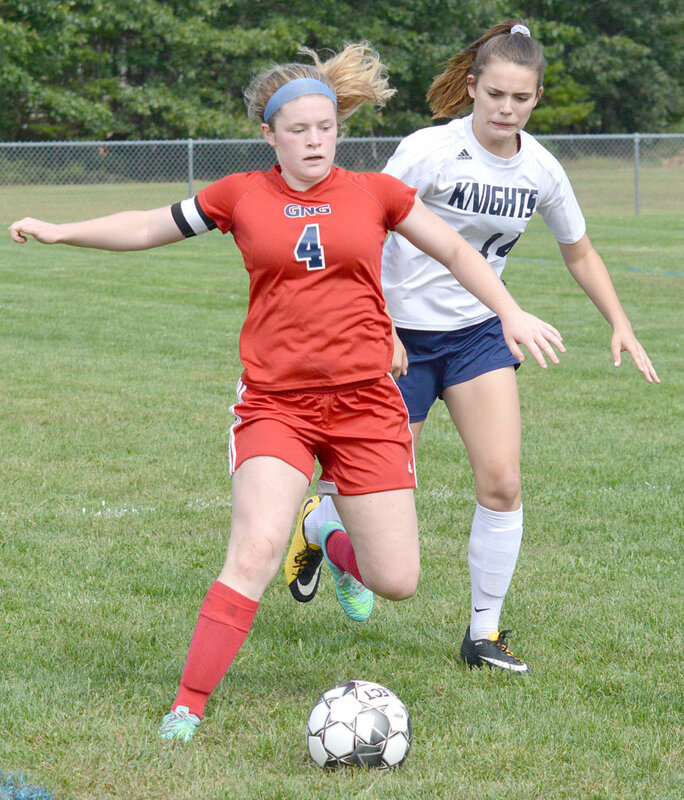 Finishing has been the focus for the Patriots, and they did plenty of it against the Knights, scoring four goals in the second half to finish off Poland, 5-0, in a WMC Class B South girls’ soccer clash at Myles Burbank Memorial Field. Bri Jordan had the lone goal of the first half, taking a feed from Jordan Grant and firing a shot into the net 14 minutes in. The Patriots (2-1) put five other shots on goal in the first half, as well as a few just off-target. The Knights (1-2) had their chances on the attack, but weren’t able to get any strikes at Patriots goalie Chelsea Davis. “I just told them, I said, ‘To be honest with you, we kind of played an even game.’ I mean, we had one mistake that caused the goal, and I thought we played even the whole first half with them,” Poland coach Tim Dolley said. 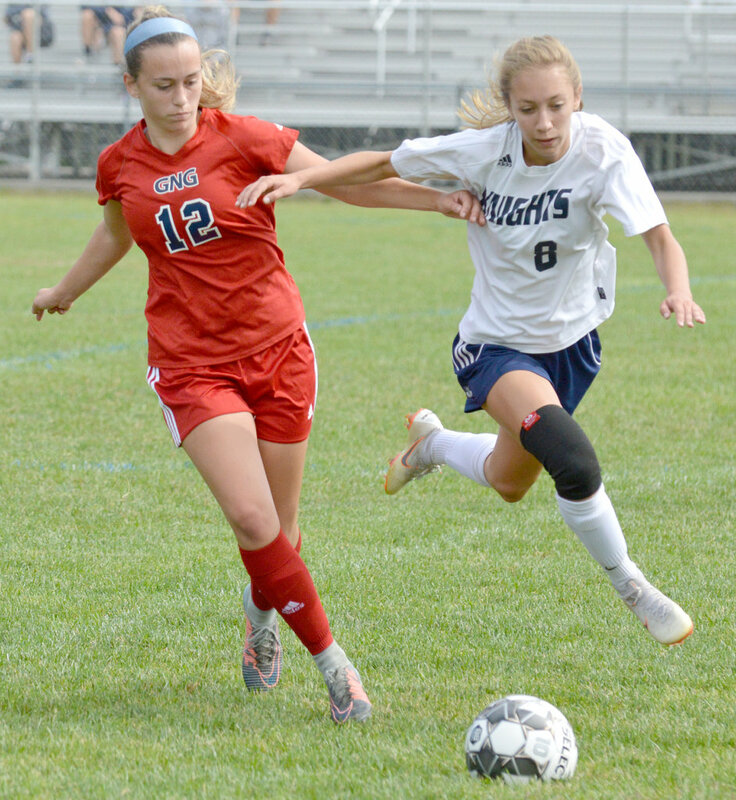 The Knights played the majority of the game without starting goalie Sophie Vallee, who got hurt making a point-blank save on Madison Brown with 14:32 left in the first half. She was replaced by freshman Gabrielle Bolduc. Bolduc didn’t face any on-target shots in her first-half action, but she was put in a tough spot in the first minute of the second half. A Davis punt after a close shot by Emma Gagne carried all the way to a charging Alexa Thayer, who took a few dribbles on the counter-attack before beating Bolduc 50 seconds in. In the Patriots’ eyes, Thayer’s goal was a big one. “A 1-0 game at halftime, that gives opportunities for either team. So I think after our second goal we kind of got more momentum and we were able to close it out,” Jordan said. Bolduc (six saves) stopped the next four shots sent her way, but couldn’t corral a cross from Grant to Jordan, who sent the loose ball into the goal 13:45 into the second half. 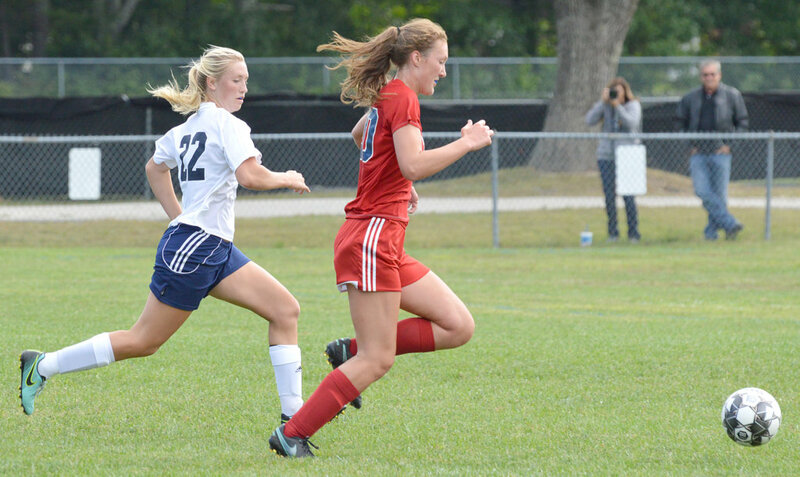 Grant later scored on a breakaway, after receiving a feed from West Duffy at midfield, and Duffy finished the scoring with a run up the right side with less than five minutes to play. Jordan said the team had “better chances, better opportunities, better looks” in the second half, leading to the offensive outburst. The Patriots’ defense never let up, even after replacing Davis with backup goalie Ivy Abrams with about 13 minutes to play. 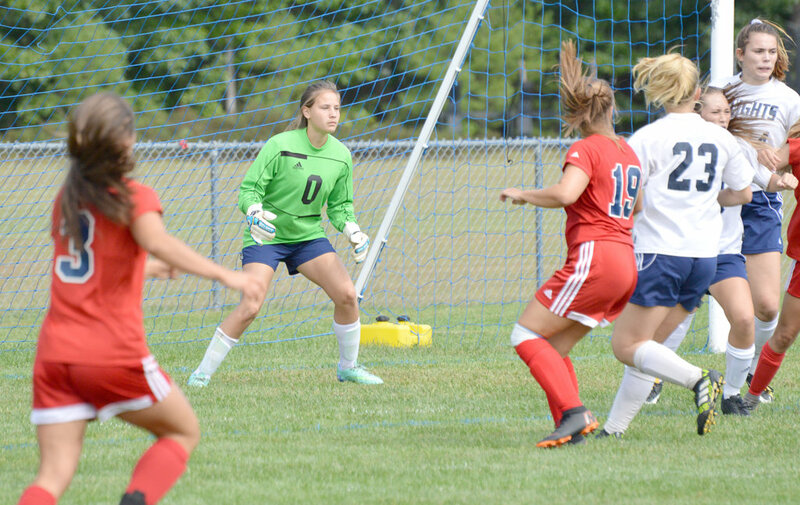 The back line of seniors Abby Ross and Kyleigh Alt, and juniors Lydia Espling and Sam Fortin — along with reserves Abigail Michaud and Maddie Soule — didn’t allow the Knights to get an on-target shot on either goalie.